Given the number of toppings listed, I knew that this burger was going to be fairly large. The waitress brought it out and she fittingly dubbed it “The Leaning Tower of Pisa”. The burger was so large that the only thing that was holding it together was the long wooden skewer. The toppings on this burger were layered almost perfectly and they really made this burger look like it was going to be full of all different kinds of flavours. After some trial and error, I managed to finally get some bites out of this monster burger. It was hard at first to get a grasp on the overall taste of the burger as all of the different toppings provided a wide variety of tastes. Once I was able to bring all the tastes together, I realized that this burger was actually pretty delicious. I loved the addition of the egg, and the Brie and cheddar came together and provided a deliciously cheesy time. The bacon and pulled pork were perfect, and there was just the right amount so they didn’t make the burger seem overpowered with meat. My one complaint with this burger was the bun. Very quickly it started to fall apart, and it didn’t have the strength to keep a burger of this magnitude together. 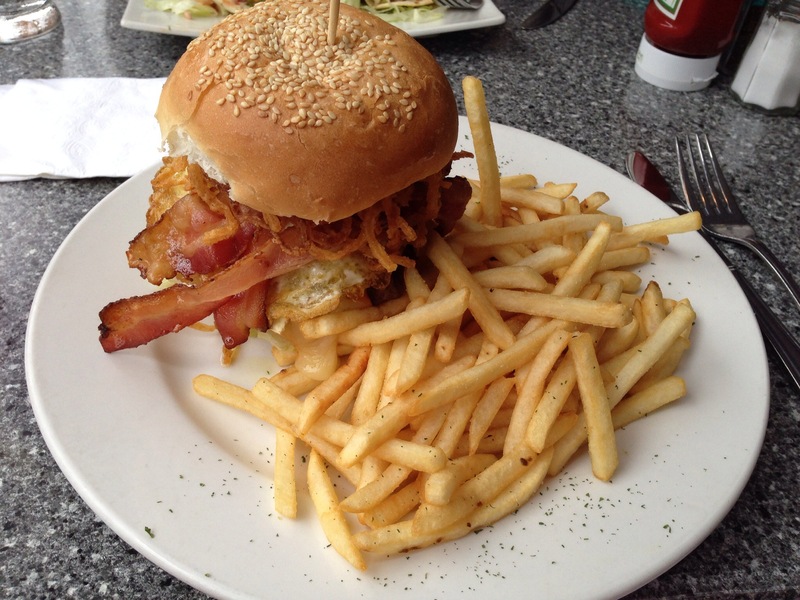 However, with a burger of this size it’s bound to get a little messy, and there is no shame in using a fork and knife for the last few bites. 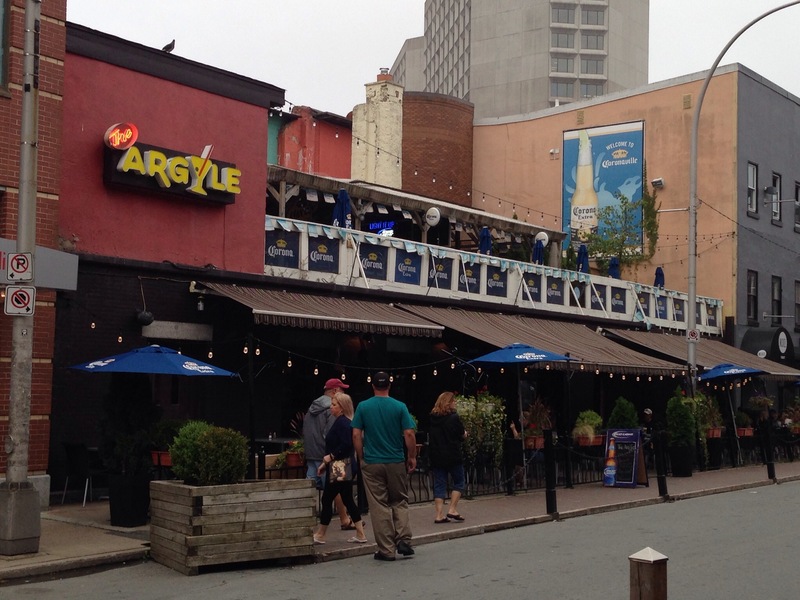 I had been to The Argyle once before a couple of years ago but I couldn’t really remember much about it (alcohol may have been involved). For this visit, we decided to sit out on their sidewalk patio, even though there was looming grey clouds in the sky. The host and the server were very friendly, and they asked a couple of times if we had any questions about the menu. Our food came pretty quickly, and there wasn’t much of a wait time between our appetizer (calamari) and our main dish. There wasn’t a whole lot of people here, mostly because we didn’t come during a peak meal time, but I have walked past this place before and it does get fairly busy. This enormous burger came with the somewhat enormous price of $17. I am somewhat conflicted with this price. On the one hand, it makes sense that a burger that consists of so many things would have to have a larger price tag. On the other hand, I can see how people may be turned off but such a large cost for a burger. For me personally, I’m glad I paid a bit more for this burger because it was really good, but it’s probably not one I would go and get all the time due to the price. This burger was great! I was worried at first that there would just be too much going on with all the toppings, but they actually do come together to create some really delicious flavours. 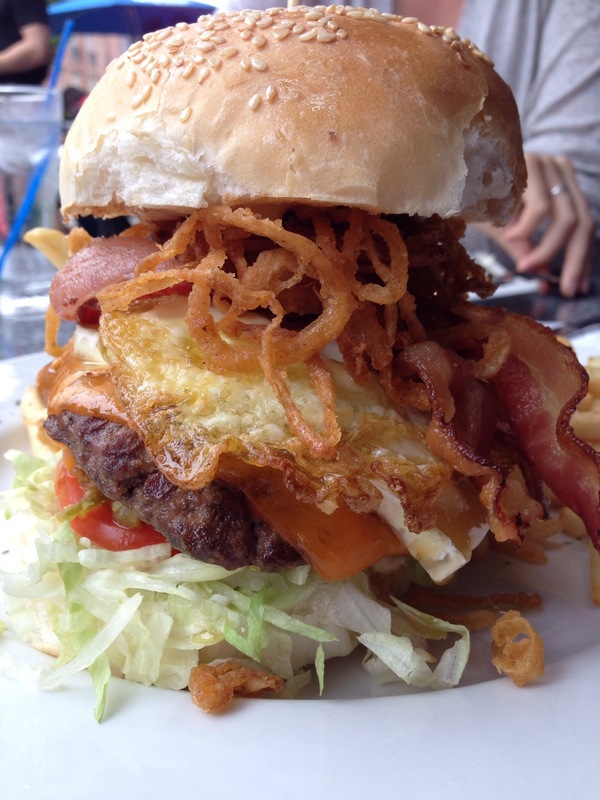 This burger is not for the faint of heart, and if you plan on going and trying it, you better make sure that you are extremely hungry.